Hereditary hemorrhagic telangiectasia (HHT) is an autosomal dominant vascular disorder that leads to abnormal blood vessel formation in the mucous membranes, skin and organs such as the brain, lungs and liver. This genetic disorder affects 1 in 5000 people worldwide and results in serious cases of morbidity and mortality. The major manifestations of HHT include mucocutaneous telangiectases (i.e. small lesions on mucous membranes) and arteriovenous malformations (AVMs) (i.e. large visceral lesions). AVMs pose a serious health risk and can lead to hemorrhage, stroke and aneurysms. Approximately 85% of HHT cases are linked to heterozygous loss-of-function mutations in the transforming growth factor beta (TGFβ) cell surface receptors activin receptor-like kinase 1 (ALK1, HHT2) or endoglin (ENG, HHT1), while SMAD4 mutations account for ~4% of HHT patients. SMAD4 mutations have gone largely unstudied, which is problematic because SMAD4 is a transcription factor that serves as the central conduit of the TGFβ signaling pathway. Previous embryonic studies have indicated that SMAD4 plays a major role in vascular development but the mechanisms of its contribution to HHT pathogenesis and its function in postnatal vasculature has remained elusive. Thus, Tulane University scientists: Angela Crist, Amanda Lee, Nehal Patel, Dawn Westhoff and led by Dr. Stryder Meadows from the Cell and Molecular Biology Department created the first SMAD4 endothelial cell (EC)-specific, inducible knockout mouse model (referred to as SMAD4-iECKO) to study AVM development and HHT pathogenesis. This research work is published in the peer-reviewed journal, Angiogenesis. The authors observed numerous AVMs with varying morphologies in the retinas of SMAD4 mutants. 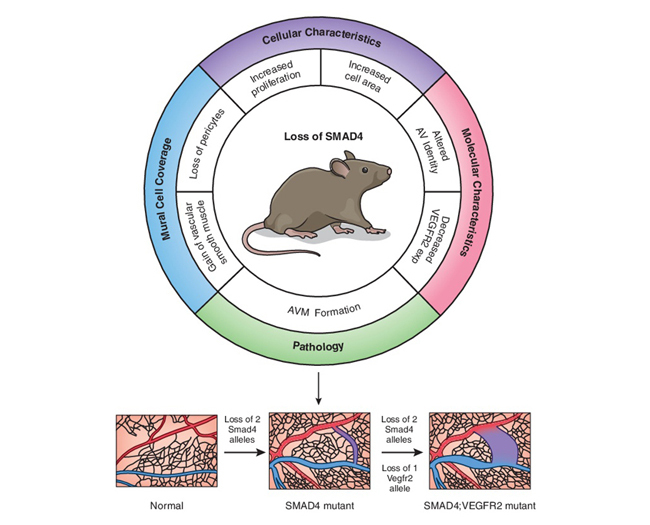 The loss of SMAD4 also resulted in a significant reduction in vascular outgrowth indicating that SMAD4 plays a critical role in angiogenesis. In addition, depletion of SMAD4 caused an increase in EC proliferation and EC size in all vessel types, but the most drastic changes were observed in the capillaries and veins of SMAD4 mutant retinas. Moreover, the authors found that the loss of SMAD4 in the endothelium resulted in defective mural cell coverage and changed the artery and vein gene expression in SMAD4 mutant retinas, which may have implications in the inappropriate artery-vein connections that comprise AVMs. Currently, HHT patients are treated with angiogenic inhibitors, such as bevacizumab, which target the VEGF-VEGFR1/2 signaling pathway. In this study, the research team at Tulane University discovered that loss of SMAD4 caused reduction in the expression of the cell surface receptor, vascular endothelial growth factor receptor 2 (VEGFR2). Moreover, they found that if one allele of VEGFR2 is lost in a SMAD4 depleted background, AVM severity and diameter is greatly increased. Therefore, their results suggest that the association between SMAD4 and VEFGR2 should be further considered for specific treatment of HHT symptoms. The study by Dr. Stryder Meadows and his research team provides compelling evidence that TGFβ and VEGF signaling pathways may be linked in AVM pathogenesis. Their novel HHT model can be used to identify new TGFβ targets that drive AVM formation and severity. Indeed the findings of Tulane University research will stimulate further studies on the role of TGFβ and VEGF pathways in the development of HHT phenotypes and AVM pathogenesis. Angela Crist started her research career at Mayo Clinic in Jacksonville, FL where she studied anaplastic thyroid cancer in Dr. John Copland’s lab. In 2014, she entered Tulane University’s Cell and Molecular Biology program where she joined the lab of Dr. Stryder Meadows. Her dissertation work focused on the development and characterization of a new Smad4 mouse model of HHT. She was specifically interested in making this model in order to identify new therapeutics for HHT patients. Dr. Stryder Meadows is an Assistant professor in the Department of Cell and Molecular Biology at Tulane University. He graduated from the University of New Mexico with a B.S. degree in Biology in 2000. Dr. Meadows then earned his Ph.D. in Molecular and Cellular Biology with Dr. Paul Krieg at the University of Arizona in 2008. His dissertation studies used the frog (Xenopus laevis) as a model system to understand the transcriptional programs regulating skeletal muscle and vascular gene expression during embryogenesis. He then trained as a postdoctoral fellow in the laboratory of Dr. Ondine Cleaver at UT Southwestern Medical Center where he used mouse genetic models to study the role of repulsive guidance cues on blood vessel patterning and morphogenesis. In 2014, he started his own laboratory at Tulane University where his research has centered on uncovering the molecular and cellular mechanisms driving AVM pathogenesis in HHT.